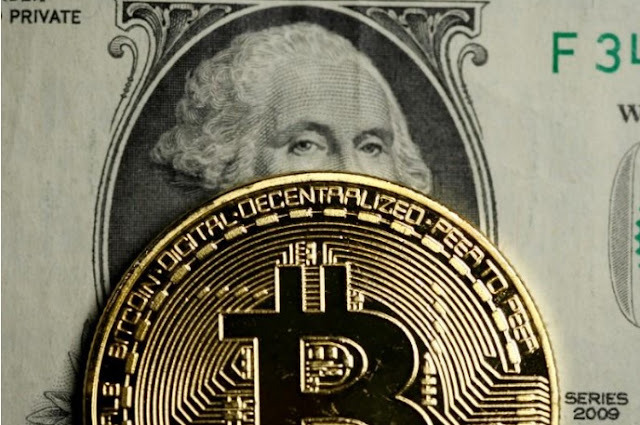 FILE PHOTO: A Bitcoin and dollar note are seen in this illustration picture taken September 27, 2017. LONDON - Bitcoin is booming, digital currency hedge funds are sprouting at the rate of two a week and the value of all cryptocurrencies has surged tenfold this year to more than $170 billion. But the fact most of the funds are relatively small with a limited track record - and that cryptocurrency price swings have been so pronounced - means the world’s pension funds, insurance companies and large mutual funds are staying away. “While cryptocurrencies are probably here to stay, they are difficult to analyze, wildly volatile and some may be prone to fraud,” said Trevor Greetham at Royal London Asset Management (RLAM), part of the Royal London life insurance company. “Diversification is a good thing but that doesn’t mean investing in everything just because it’s there. We favor assets with a long track record in producing returns or reducing risks,” said Greetham, who heads RLAM’s multi asset team. Bitcoin’s total value, or market capitalization, is close to $100 billion, bigger than U.S. investment bank Morgan Stanley. At the start of the year it was just $15 billion. Ethereum, the second-biggest cryptocurrency, is now worth almost $30 billion. Bitcoin is booming, digital currency hedge funds are sprouting at the rate of two a week and the value of all cryptocurrencies has surged tenfold this year to more than $170 billion. Yet for all the hype, mainstream institutional investors are steering clear of the nascent market, taking the view that it is too lightly regulated, too volatile and too illiquid to risk investing other people’s money in.